Ministry of Caring : Why Support The Ministry of Caring? Why Support The Ministry of Caring? demonstrates a living example of how generosity and goodwill make dramatic differences in the lives of the poor and homeless. attracts an army of volunteers who bring extra caring and compassion to those who need it most. helps put the poor to work through job training at its Job Placement Center. assists in neighborhood revitalization. The presence of Ministry of Caring sites in underserved neighborhoods in Wilmington helps bring stability and pride to these areas. 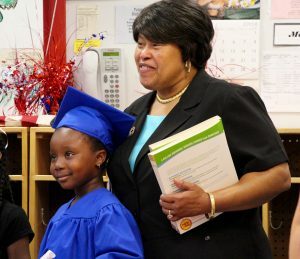 Guardian Angel Teacher Laytina James with a pre-school graduate. To maintain our comprehensive, high-quality programs for the poor, the Ministry of Caring needs your help. We invite you to give to where the need is greatest, our General Fund, or to a specific program. Your tax-deductible gift is always used wisely. Gifts by credit card, check, cash or stock are gratefully accepted. Do you work for a company that provides matching funds to your charitable contributions? If so, the Ministry of Caring will be grateful if you inform your company of your donation. You will help the poor even more! It is a gratifying gesture to give to the poor at regular intervals. A donation every month or quarter, in whatever amount you can afford, fills many needs of the underserved. Your cumulative donations help us to provide the food, shelter, clothing, case management or job placement services that help lift Delaware’s poor to lives of self-sufficiency and hope. It’s easy to get into the habit of regular giving to the Ministry of Caring. Just fill out the form below and choose the frequency for your donations. If you order items from Amazon, you can designate the Ministry of Caring to receive 0.5% of the purchase price. Just visit smile.amazon.com, select the MOC and shop as you normally would. Once you choose the Ministry the first time you enter, it will automatically default to that each time you place an order. Organizations and individuals who join the Legacy of Giving pledge to support the Ministry of Caring with a minimum annual donation of $1,200.00. The Legacy of Giving provides a vital source of funding that the Ministry of Caring can depend on for much-needed operational expenses. To learn more about this special membership organization, call 302-652-5523 or email Cindy Gamble. 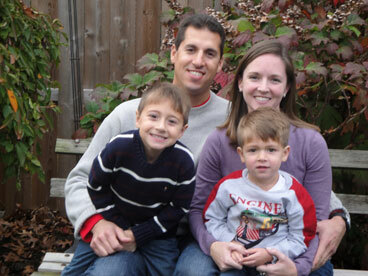 Damian and Jen Andrisani, with sons Paul (l.) and Damian, Jr., are charter members of the Legacy of Giving. If you would like further information about giving to the Ministry of Caring, please call302-652-5523 or send an email to the Development Office.